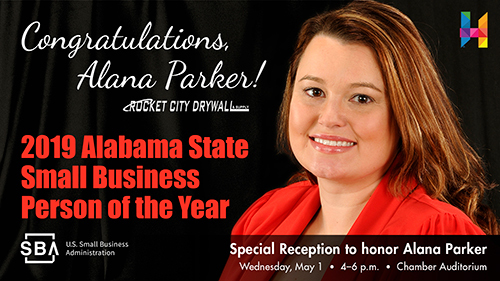 Please join us for a very special reception to honor Huntsville's very own Alana Parker with Rocket City Drywall. Parker was recently named Alabama's Small Business Person of the Year by the Small Business Administration...what an accomplishment! We'll have beverages and light refreshments on deck for this special occasion. Be sure to stop by to congratulate Parker on this fantastic achievement!